The hot months are approaching, and we will be seeing more sunny days. You may be aware that besides sunburn, there is also the risk of skin cancer and premature skin aging caused by the harmful sunlight. But that doesn’t mean that we should avoid the sun totally. We still need sunlight for its vitamin D boosting benefits. Read on to learn more about the sunlight and how we can protect ourselves with natural sunscreen from the sun’s harmful rays. The sunlight that reaches us is made up of two types of harmful rays: long wave ultraviolet A (UVA) and short wave ultraviolet B (UVB). UVA rays penetrate deep into the dermis, the skin’s thickest layer. Unprotected exposure can lead to premature skin aging and wrinkling (photoaging), and suppression of the immune system. UVB rays will usually burn the superficial layers of your skin. It plays a key role in the development of skin cancer. The intensity of UVB rays vary by season, location and time of day, with 10AM to 4PM being the peak hours. Sunburned skin doesn’t just feel awful, it can cause permanent damage over time. 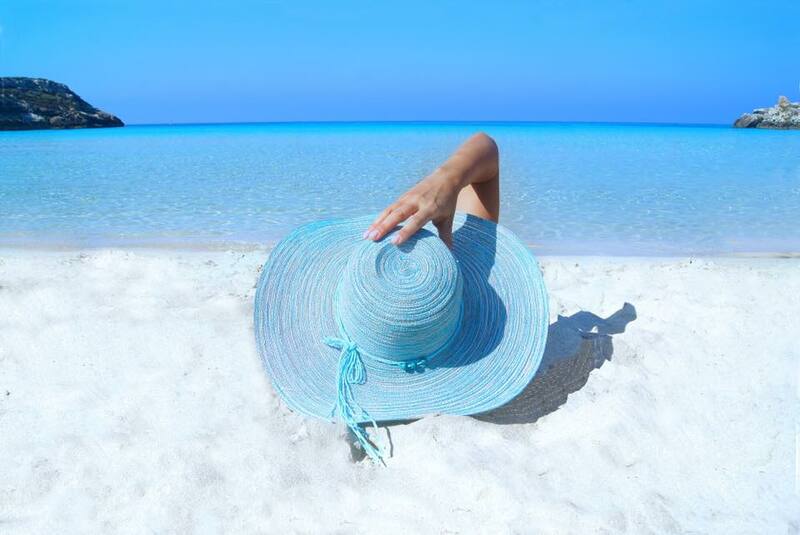 SPF stands for sun protection factor. The SPF value indicates the level of sunburn protection provided by the sunscreen product. The SPF rating is calculated by comparing the amount of time needed to burn sunscreen-protected skin vs. unprotected skin. Because SPF values are determined from a test that measures protection against sunburn caused by UVB radiation, SPF values only indicate a sunscreen’s UVB protection. To protect against both UVA and UVB, use a broad spectrum SPF of 30 or higher to protect not only against sunburn, but reduce the risk of skin cancer and premature skin aging caused by the sun. What Is A Natural Sunscreen? Let us tell you how a natural sunscreen is different from one you grab off a shelf in a drugstore. Your conventional sunscreen works by absorbing the sun’s UV rays with chemicals. These chemicals are actually reacting with UV rays right on your skin surface, and are turned into heat that is then released from your skin. This can spell bad news for those of you with sensitive skin. The chemical reaction and heat release caused by many chemical sunscreen can irritate skin and trigger the formation of dark spots. (Yes, over-heated skin can make brown spots worse. Will share more in next blog. Watch out for it!) What’s more, many of the chemicals that are used in conventional sunscreens, such as Oxybenzone, have been linked to hormone disruption and skin allergies. Always check the ingredient list on your sunscreen! Avoid ingredients such as Oxybenzone, Vitamin A and added insect repellent. We have a wide range of natural sunscreens, also known as a physical sunscreen, because it works by physically blocking, instead of reacting with UVA and UVB rays. You see it being called mineral sunscreen, because it uses minerals like non-nano sized zinc oxide and titanium oxide to shield against UV rays. Another thing you might notice with our natural sunscreen range is that it leaves a white cast upon application, and you’ll need to thoroughly massage it into your skin to get it to naturally blend with your skin tone. This is actually great news for your skin! It’s a sign that the mineral particles are large enough to shield your skin. All of our natural sunscreens are non-comedogenic, so you can wear under or over makeup and reapply throughout the day, without worrying about clogging your pores or irritating your skin. Give your skin an immediate line-smoothing matte finish and fight signs of aging caused by the sun with this Farm to Face® sourced, coral reef friendly, antioxidant-infused, broad spectrum SPF 30 mineral sunscreen. This Cucumber scented formula is made with natural Rose Hip Oil which is rich in free radical fighting Vitamin C. Naturally calming Evening Primrose and Flax Seed Oils deliver abundant Omega-3 and Gamma-Linolenic Acid to improve elasticity and help skin retain moisture. Natural Shea Butter smooths and hydrates while the phyto-protector Plankton Extract rejuvenates skin. Formulated for all skin types and tones, including those that are especially sensitive or oily. An all in one, “UV Chemical-Free” Tinted Sunscreen/Beauty Benefit (BB) cream that treats, hydrates, protects, primes and covers the skin. It has a cosmetic safety rating of #1 from the Environmental Working Group database, which is the highest safety rating, meaning lowest toxicity and least hazard to health and environment. It’s also supercharged with youth promoting antioxidants that help to scavenge surface free radicals. Hyaluronic acid, astaxanthin, red algae and Certified Organic: aloe vera, jojoba, sunflower, pomegranate, cucumber, and green tea help provide additional sun protection and hydration. Non-nano sized zinc-oxide not only protects the skin from the damaging UV rays, but it also soothes and calms the skin. Zinc-oxide is known for it’s anti-inflammatory properties that often help skin conditions like rosacea, acne, and melasma. This convenient, water resistant Sport Sun Stick provides UVA/UVB Broad Spectrum protection from the sun’s harmful rays. Formulated with non-nano zinc oxide in a solid stick form, it glides onto skin smoothly without leaving a greasy feel. Organic coconut oil, shea butter and cocoa seed butter leave the skin hydrated and moisturized while organic sweet orange essential oil uplifts the senses. This stick is great for quick touch-ups on your hands, face, chest and shoulders. Suitable for everyone in the family, including young children. Always make sure to follow a strict regime. That means wearing SPF even on cloudy days, and reapplying reapplying again at least every 2 hours, and more often if swimming or sweating. And of course, always keep a sunscreen handy, with your sunglasses, umbrella, and hat in your purse for maximum protection, while enjoying the sunny days.